When the bath is installed in its place, it is necessary to perform the last stage of work, after which you can put it into operation. An important step is to connect the bath to the sewer and water supply. In this article you will learn how to connect the bath to the sewage with your own hands. First of all, perform a series of preparatory work. Also consider what material you will use to connect the bath to the sewer. Bath is recommended to connect only with the use of a siphon. 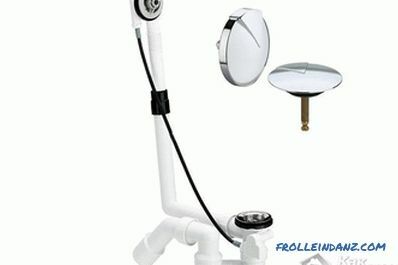 It has a special system and components that allow you to connect into one whole hole overflow and drain. 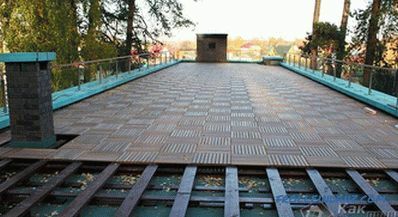 It is not recommended to use only corrugated pipes. Why? they are quickly filled with various kinds of pollution. 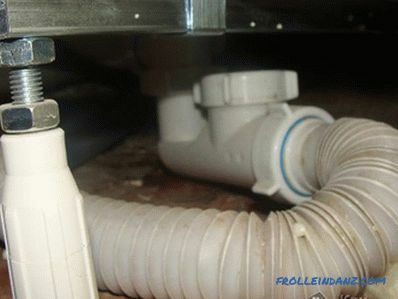 Before the direct connection, it is important to achieve the appropriate height difference between the connection point and the drain pipe. The siphon outlet must be high enough to ensure good water outflow. It is equally important to ensure free access to the already installed siphon. From time to time it will need to be cleaned from internal contamination. If he is in an inaccessible place, it will be difficult to do this work. 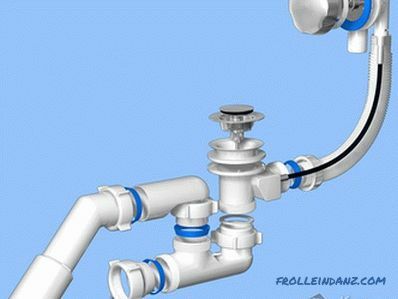 If your sewage system is made of plastic pipes, then the siphon can be connected using a flexible pipe Ø40 mm. It is important to use a rubber junction to connect to the sewer. If the sewer has a Ø50 mm, then a transition of 50 to 40 mm is needed. If you have cast iron pipes, then you will need to purchase a Ø73 rubber coupling for 40. Drain plug. In some cases, its production is made of rubber or plastic. The top of the tube is covered with stainless steel. Some siphon kits may have a chain that is attached to the overflow and to the cork. Thanks to her, you will be able to lift the cork without putting your hands in the dirty water. Metal overflow and drain grating. Thanks to this element, no object will fall into the sink. In expensive models of siphons, this element is made of stainless steel, and in cheap ones - of plastic. Rubber gasket. The color of the gasket, which is installed on the reverse side, does not matter. It prevents water from entering between the outlet and the bathtub drain. Outlet outlet. Used to drain water. Exhaust nut. It is made of both plastic and metal. Removable knee. 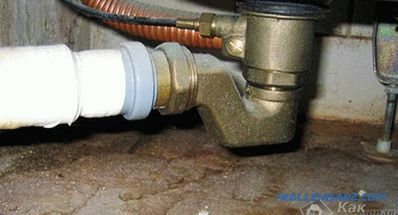 It is necessary to clean the siphon from possible blockages. Thanks to the removable knee, you can clean without complete disassembly. 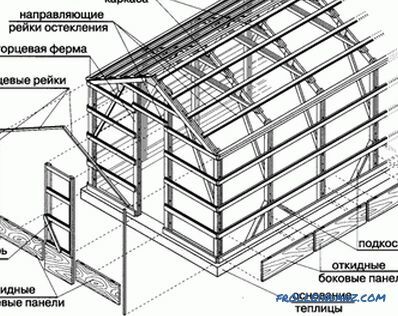 Mechanical system. It uses a simple rubber or plastic stopper. Drain the water by hand. The system is simple and at the same time reliable. Semi-automatic system. 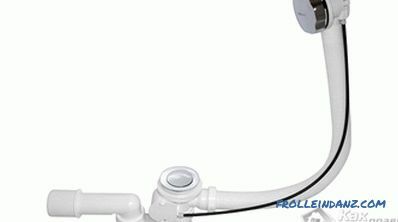 The drain mechanism is controlled by a special cable / lever element. This mechanism is set above the water level, which is usually typed in the bath. Automatic system. Siphon in this case with the filling equipment is combined into one design. Management is carried out thanks to the built-in / remote microprocessor. The siphon installation technology is very is simple. If you follow the manufacturer's instructions, then you will be able to do everything yourself. If you It is necessary to replace the old siphon, then after its dismantling, the junction of the siphon should be well cleaned. After that, a gasket is inserted into the lower overflow and is attached to the lower drain hole.In parallel, the other hand attaches the top plate and is screwed to the drain hole. Holding the bottom, tighten the screw on top. 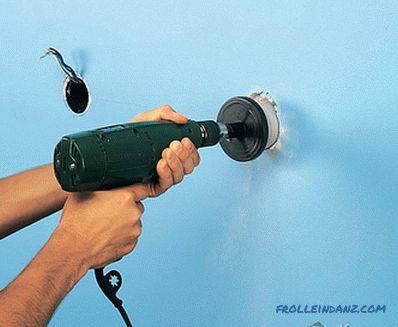 When tightening the screw, it is important not to overdo it. If the case is plastic, then it can easily burst. By the same principle, the upper overflow is established. Now the overflow with the drain is connected to the corrugated hose. If the hose is longer than intended, do not cut it. Just give it a smooth shape. If a nut is used in your siphon model for sealing, then install with a thin end to the overflow pipe and drain. On the corrugation, first put the nut on, and after the rubber seal. Next, a water seal is connected. A cap nut with a tapered or flat gasket is used for the connection. To connect the siphon, connect the nozzle to the water trap. At this stage, the siphon is connected to the sewer system. Depending on the diameter of the nozzle, you may need a rubber cuff. At the very end, you should check all the work for leaks. With a good assembly of the neck water will not leak. After that, flush the bathtub and also check the entire assembly for tightness. Leaks can occur for two reasons: bad tightened the nut or when the connection formed a bias. 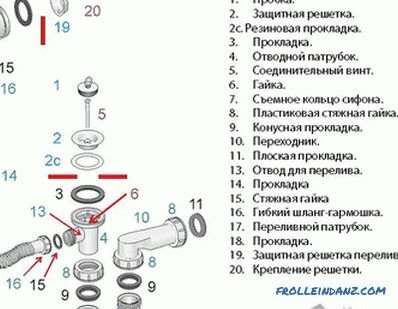 Siphon assembly is best to start after studying the attached instructions. If there are rough edges in the drain or overflow holes, they should be sanded. Displacements are not allowed. In some cases, you have to use silicone sealant. 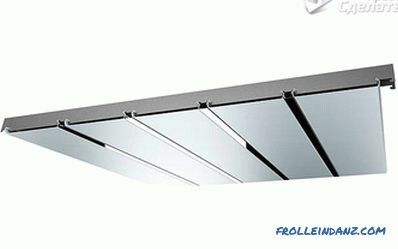 It is necessary to control the height difference between the drain and the drain into the sewer. 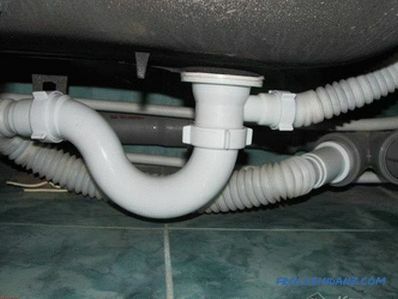 The slope of the pipe must be at least 1 cm per 1 m.
So, apparently, you do not need to be an expert to understand the connection of the bath to the sewage system. Before you connect the bath, consider each step of the work. If you already have experience in this work, be sure to write about it in the comments.